The Three Day Racing School is every driver’s gateway to motorsports and racing. 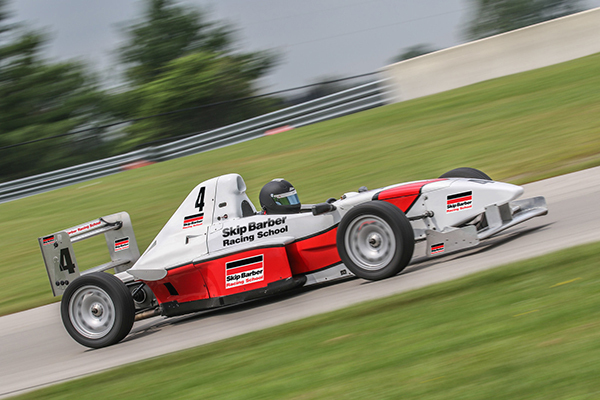 This is Skip Barber Racing School’s signature product – with a curriculum that combines classroom sessions with practical hands on seat time. The Three Day Racing School is a prerequisite for racers interested in obtaining a club, professional or international racing license. In this unique program, students master the fundamentals of racing in classroom and driving sessions. The Skip Barber Formula car is based upon the SCCA Van Diemen Formula E spec’d with it’s 170 HP turning through an Elite sequential gearbox and the stopping power from AP Racing Brakes. The driver will have a Pi Research digital in steering wheel dash with RPM arc lights for shifting. This race car provides an amazing experience in braking, handling and acceleration capabilities! Formula Car Programs are currently available on the Driver Development Track at Canadian Tire Motorsports Park. In the morning, students will spend some time in the classroom reviewing the Skip Barber Formula car, vehicle dynamics, the proper racing line, race style downshifting, threshold braking, and cornering techniques. All of these subjects are important in helping the racer find their “limit” inside the race car and discovering the car’s true capability. The students then head out to pit lane where Skip Barber instructors provide a hands on introduction to the Formula car in preparation for on-track training. The racing downshifting exercise takes place before turning the first on track laps of the school in lead-follow sessions.